My Mum, Three Blue Domes, Wedding Couple and Photography Crew. So you’ve seen pictures of a little island with white houses on the cliff edge and a three blue domed church. You’ve read that this island is one of the best and most romantic places to watch the sunset. Santorini is mentioned in the media so often that without researching any of the other islands (over 150) in Greece, you’ve already decided that this is the place you want to visit. Oh you’ve also read about Mykonos, which is the other most visited island. But you’ve decided against it when you heard the rumour that only people who like to party go there. Well, I’m not really talking about you! I don’t know anything about you and thank you for being here reading my post. The above is based on what I heard from my friends in Hong Kong and also what their friends told them. Oh yes, the other reason is that ‘Santorini is a must because my friends went there’. Earlier this summer my mum and a few relatives came to Greece. When asked what they would like to do, they said they would like to eat and shop, and to see the Aegean sea. They didn’t say Santorini but I chose it for them because I didn’t want them to feel missed out when their friends mentioned Santorini to them. They did enjoy Santorini’s lovely scenery however not so much because of certain Mutant Greek People we came across. Hopefully this article to help you to better prepare yourself to have the best time in Santorini. 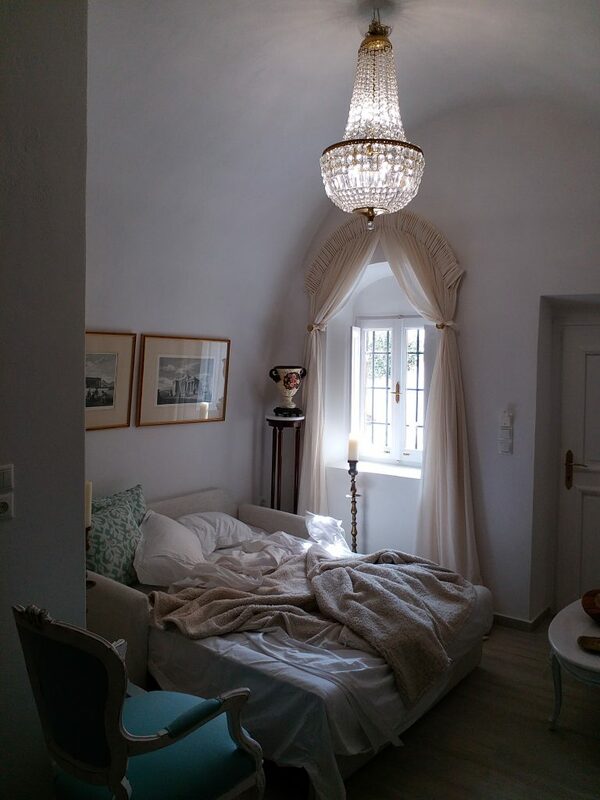 I’ve also included places that my Greek Teacher Sophie loves at the end of this post. Santorini, alongside with Mykonos, probably is the most well known tourist destination in Greece. 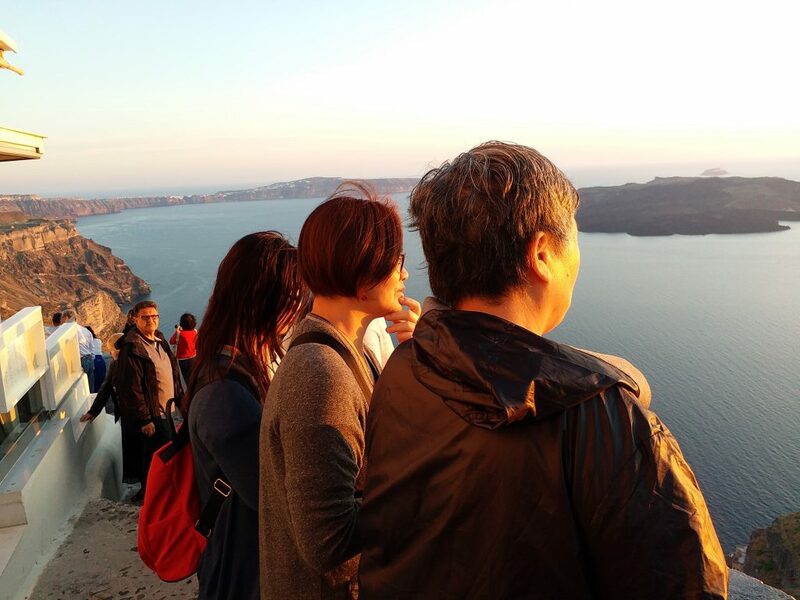 Santorini is more so for Chinese people. 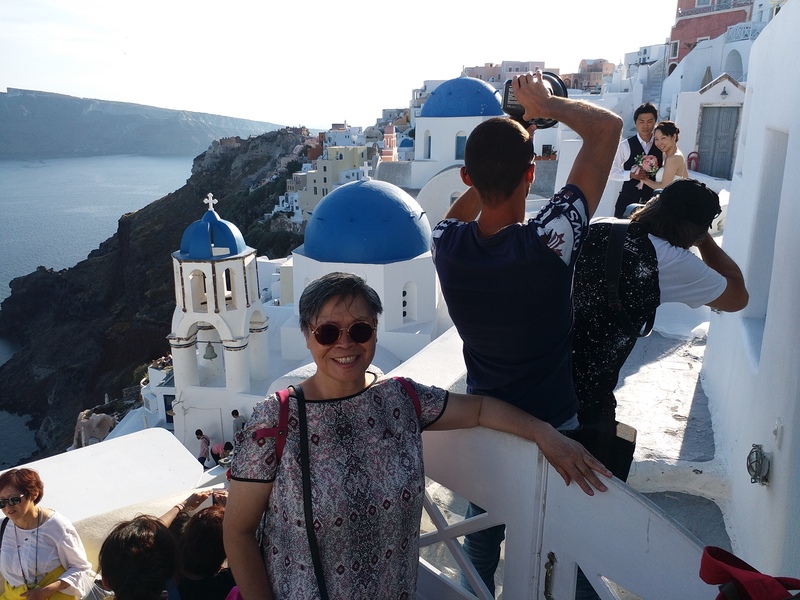 I heard a story about how Santorini was made famous to my part of the world because a Greek restaurant owner there married a Chinese wife and together they did a very good job in promoting the island to people in Asia. 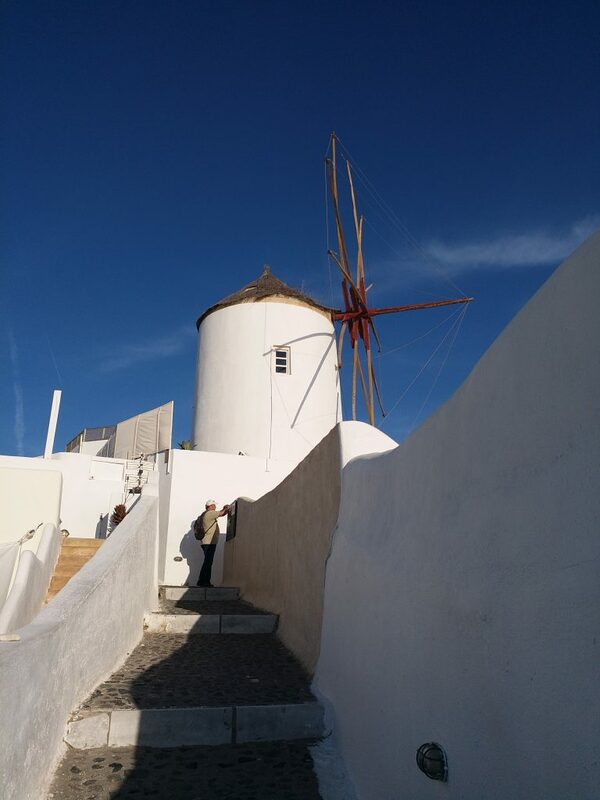 I had only visited Santorini once previously, in 1996 and I quite looked forward to the visit especially because one of my QHHT colleagues pointed out that Santorini was part of the Atlantis and many people visit Santorini because they had past lives there. My husband told me on one of his work trips there, he had a vision on how the island was formed from the volcanic eruptions. 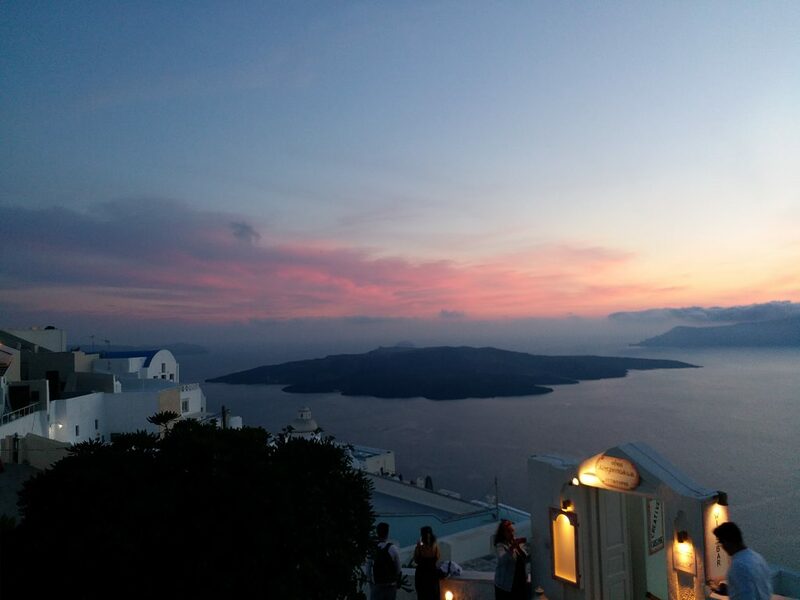 When I talked about this with a Greek friend, she said Santorini always made her nervous. Maybe she witnessed the disaster in one of her previous lives? You do not need to be aware all these past lives and Atlantis things in order to enjoy Santorini. But if you are interested, you can always book a QHHT session with me or one of my colleagues. There are also many past life meditations available online as well as information about Atlantis. More importantly, let’s talk about what to expect in Santorini. 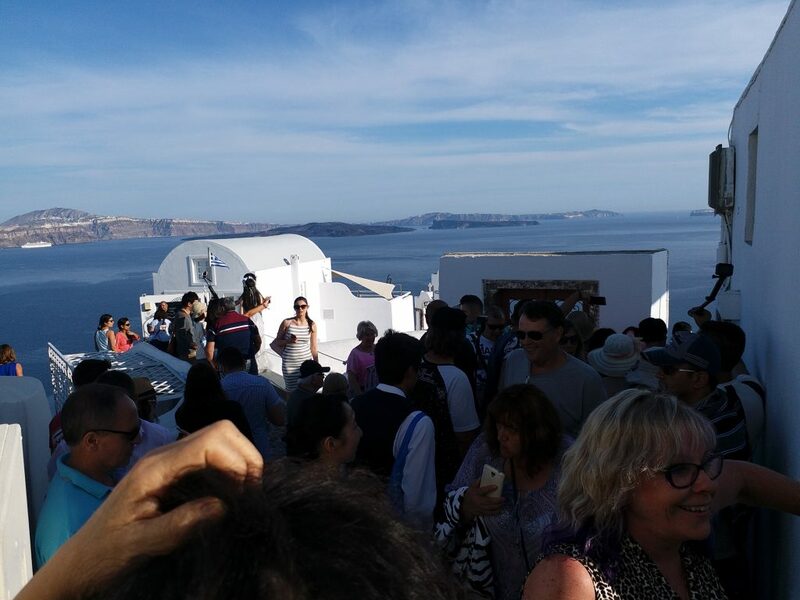 My family and I visited Santorini in mid May which is the beginning of the summer season but the island was packed with tourists! It was crowded in the town, crowded in both the main town and another town during sunsets, crowded at the harbour, bus stations… it was just crowded everywhere apart from inside the apartment where we stayed. 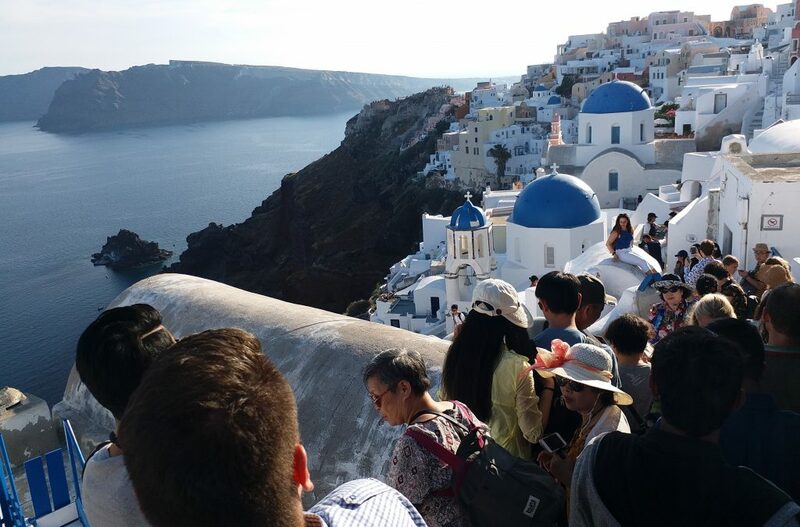 My Hong Kong friend told me that all her colleagues and friends who visited Santorini loved it. I guess people like what they are used to and people who are from big cities wouldn’t think the crowd in Santorini anything out of the ordinary. 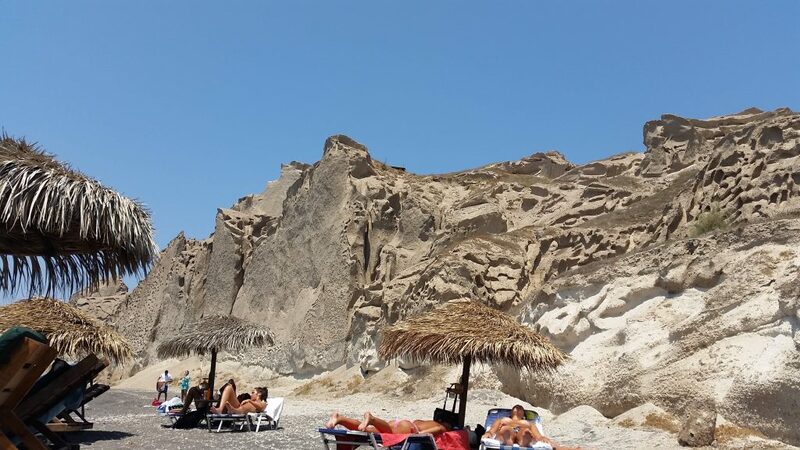 However, if you are thinking about a relaxing time on a Greek island, Santorini is probably not the best place, unless you are driving and know where to go, like Sophie my Greek teacher. The crowd at Oia and it was only May. People climb roofs to be away from crowd. 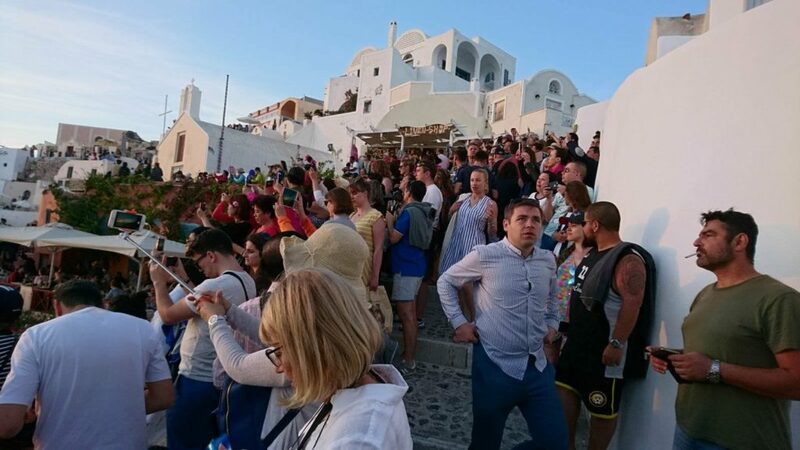 The crowd at Oia for the sunset. Photo by my cousin. Santorini is famous for its sunset. Tour operators advertise it as the most romantic sunset in Greece if not the world. It is ridiculous anyway if you think about it – how do they know? How many places these people had traveled to before making such a statement? We went to Oia anyway in attempt to watch the sunset. 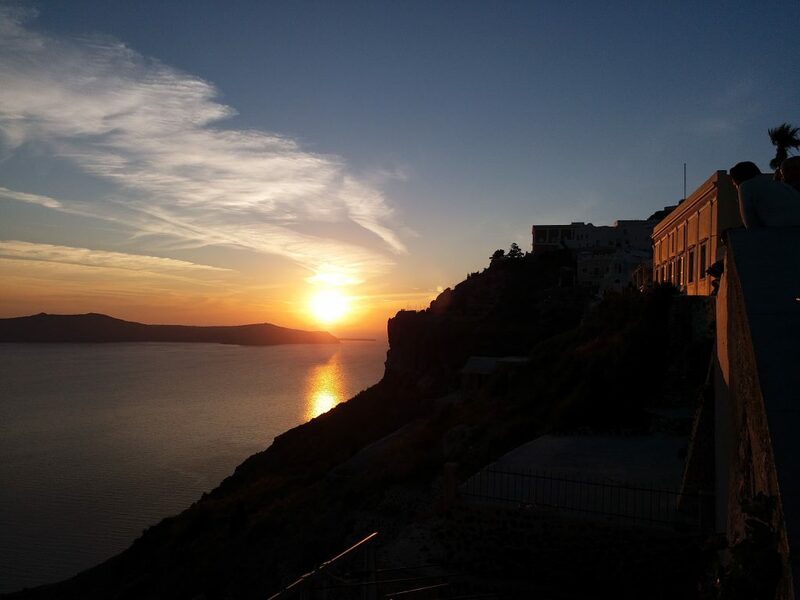 Oia is supposed to be one of the best spots to watch the sunset in Santorini. My husband said he could see why this is a good spot as it offered an un-obstructive to the sunset, although he was there for work and didn’t participate any sunset watching. My family and I took the public bus at Fira which is the main town in Santorini. Santorini is a small island but the bus journey from Fira to Oia lasted over 50 minutes due to the narrow road and traffic jam. There seems to be only one main road connecting the harbour to all the main towns. One of my aunties asked me earlier if and why would people visit Santorini during winter. When our bus got totally stuck, I told her this was the reason. We were at Oia early to secure a spot for sunset watching. After an hour’s wait, my mum, uncle and auntie decided it wasn’t worth their time to continue waiting, especially because a woman who was standing next to us was chain smoking. They also thought once the sunset was over, the queue to the bus would be very long and the traffic would probably become unbearable. My other auntie and cousin persisted and stayed till the sunset was over but they didn’t think much of it other than that there were a lot of people. So unless you have the money to stay at the expensive hotels on the caldera or know a secret hiding spot, the sunset won’t be at all romantic for you. One best thing I can think of for the Santorini sunset is if we were to make a Guiness’s World Record on the most amount of people watching sunset together. Mum, Auntie and Cousin. The golden sunlight lit up everyone beautifully. Beautiful sky at top of the caldera at Fira. My Mum photographing our luxuries for the day. Cafe/Restaurant at Caldera. Many tourists including us hang around on the top of the caldera where the large beautiful white Orthodox Metropolitan Cathedral is. The view is breath-taking and it is interesting to look down at what people are doing in their private pools and balconies. There are cafes, bars and restaurants on the caldera. We stopped at one of these restaurants to have a drink and some snacks. It was expensive but we wanted to enjoy the view. We chose more expensive drinks like strawberry juice and peach juice because at least these for us worth the 9 euro that we paid, more than the orange juice that cost 7. My uncle had a boutique beer called Fresh Chios Beer and he said it was the best beer that he ever tasted. It was 12 euro. The most common Greek beer at this restaurant cost 9 euro. 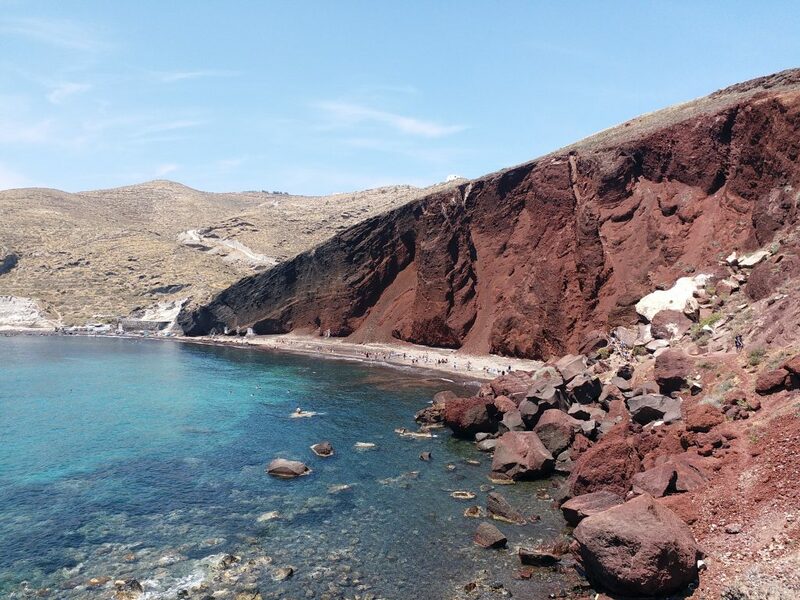 Santorini’s unique landscape was formed after a few massive volcanic eruptions many thousand years ago. 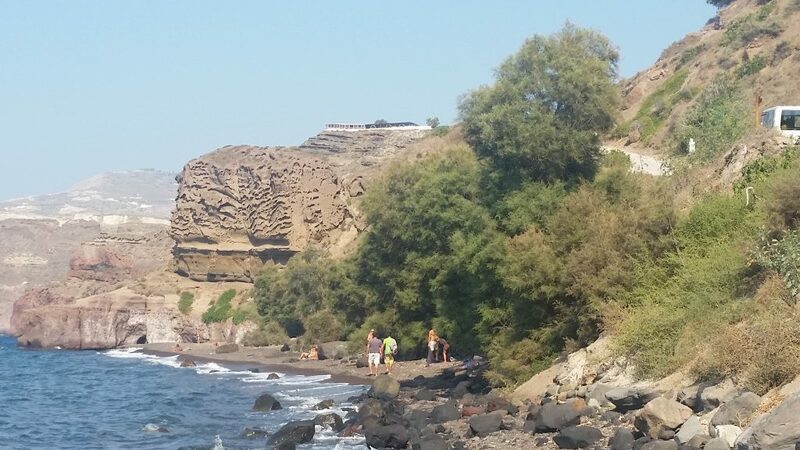 These eruptions threw many layers of the earth around, forming the different coloured beaches as well as the caldera which is the huge grandstand like cliff where many hotels and villas are built. There are different types of boat trips to the volcano daily. The cheapest one that we found was 15 euro offering the most basic trip to the volcano and the hot spring. There are also more luxurious ones that take you to different colour beaches in lovely looking yachts inclusive of lunch, hotel pick-up and drop-off. I never visited the volcano but my cousin and her mum did. 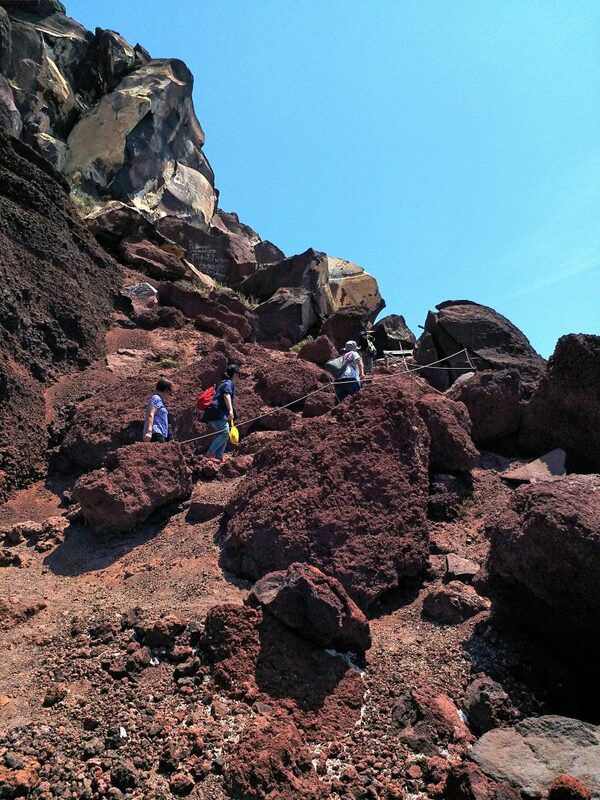 My cousin said it felt like something for tourists to do, walking on the volcano, looking back at the caldera. They didn’t take a dip in the hot spring. I read from reviews that the hot spring wasn’t hot but warm. Perhaps it would be nice to go in winter but I can’t imagine anything appealing about a hot spring in the hot summer months. If you plan to visit the volcano, please remember to bring your hat and wear plenty of sunscreen as there is no shade at all there. There are three options for going down and up the cliff: stairs, cable car and donkey ride. My cousin was quite excited about riding a donkey. It didn’t appeal to me because I thought the donkeys were made slaves. Cousin pointed out that the donkeys were strong and had no problems carrying us humans. In the end she didn’t ride a donkey for fear of falling off it. The path was full of donkey poo so if one fell, one could be covered in donkey poo on top of potential injuries. When we walked down the staircase/path, I was saddened by the sight of the donkeys. 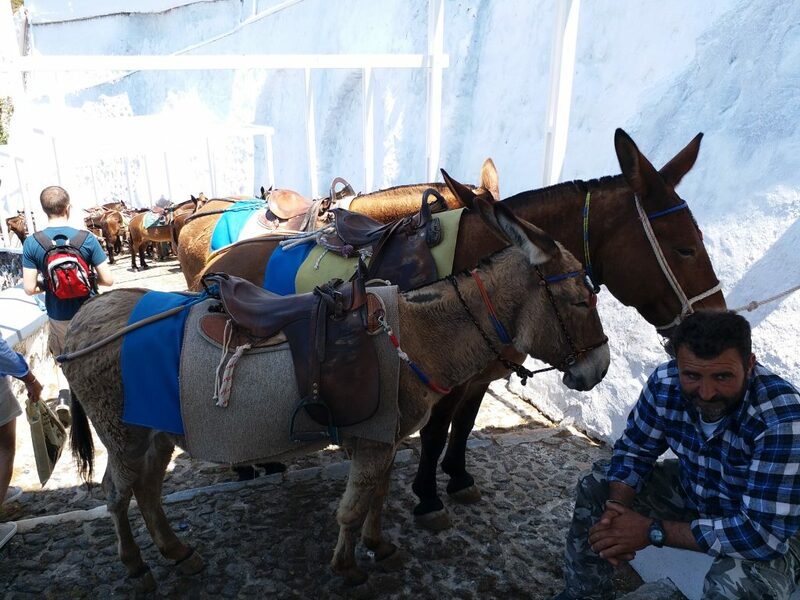 It was a hot sunny day and the donkeys lined up there waiting. Most of them were outside the makeshift shade. They were probably fed but not as often as they liked because I didn’t see grass or water near them. Some of them stood facing the wall, hiding from the many people who walked past them. Walking down the cliff wasn’t physically challenging as the path was well paved. The walk felt really long – the cliff is very high up and also because of the hot sun and the pungent smell of the donkey poo. There were souvenir shops and restaurants at the harbour down the cliff as well as many more tourists. We saw tour operators offering boat trips. Unfortunately there are no water bus like in Mykonos and we found the prices all quite steep. We took the cable car back up the cliff. The queue diminished quite quickly as the service was frequent. The ride only lasted a few minutes so have your camera ready! If you need to go down the cliff to take the boat trips, please allow yourself plenty of time to queue up for the cable car. Despite the frequent service and short ride, it might take you over half an hour. There was an extraordinary long queue the morning my cousin and her mum visited the volcano and they ended up rushing down the path instead of waiting for the cable car. 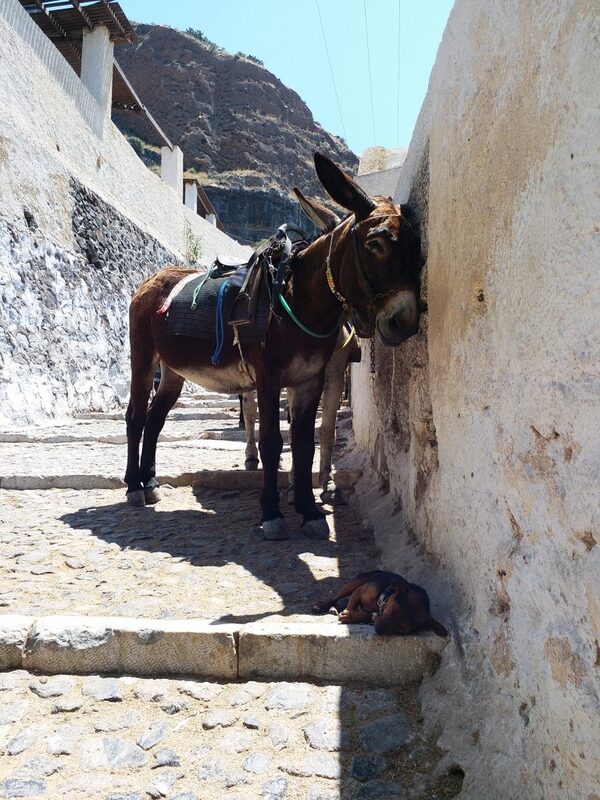 A Donkey tries to get some shade. Have you seen that famous postcard with the three blue-domed church? Since this church is in Oia, we decided to have a look before finding a spot for the sunset that we didn’t end up watching. There were so so so so many people! Everyone there waited or pushed for their turn to take photos. It is quite beautiful there and if you are prepared for the crowd, it can be a bit of fun to compete for the photo spots. We saw two couples having their wedding portraits shot there. I really felt for the photographers having to fight off all the tourists and I don’t think the couples had a enjoyable time there either – imagine being in the crowd in your fineries and having to look lovey-dovey. There are many beautiful places in Greece for portraits but if you are fixated about this particular church and the caldera view, Santorini is the only place. My mum (with backpack) heading towards the famous three blue-dome church. Yes the beach really is red and is quite spectacular to look at. The water is crystal clear. Part of the shore is quite rocky and is full of red and black pebbles. It took my family (my mum and my uncle are in their 60s) about 20 minutes to walk there from the bus stop at Akrotiri, discounting the photo stops. We had to watch our every step and walked quite slowly because the path is not paved. I read that there is danger of landslide and falling rocks and it really looked like these could happen. Didn’t stop us or many of the tourists there though. I like this beach a lot because it’s not every day that we get to be surrounded by red and blue (the sky and the sea). If I go there again, I would also visit the Akrotiri Archaeological Site which is just one bus stop before the terminal. 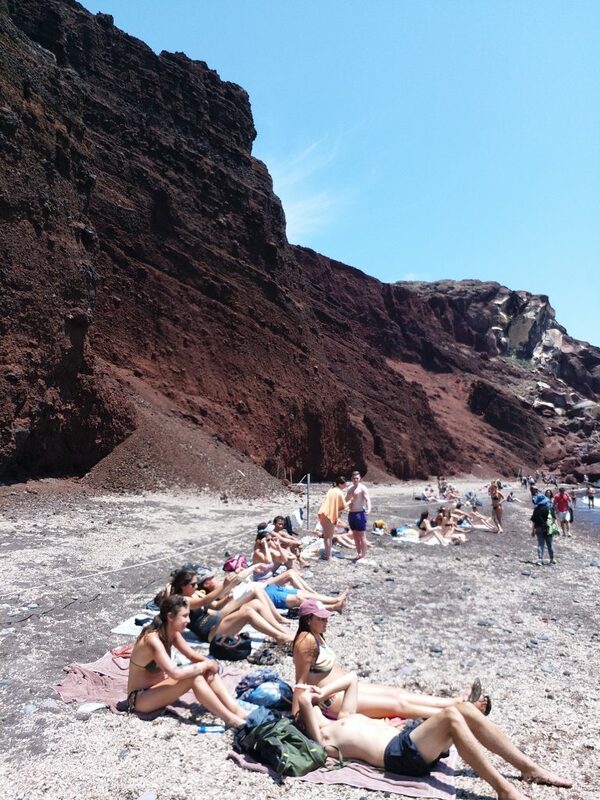 People sunbathing at Red Beach. It doesn’t look appealing but you get the red cliff behind you and crystal clear water. The only time I went to a Black Beach was back in 1996. The only thing I remember was feeling quite odd that the beach was black and was afraid the black colour would stain my clothing – no, it didn’t. The sand wasn’t fine but the water was beautifully clear. It’s not the typical sandy beaches that people are used to but it is always nice to enjoy something different. 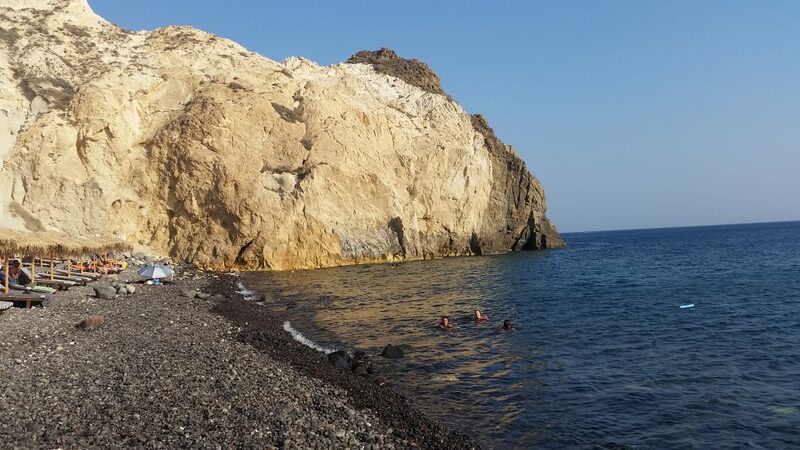 Sophie, my Greek teacher, told me some of her favourite beaches in Santorini. Please see below. Where to stay very much depends on if you are planning to drive and your budget. 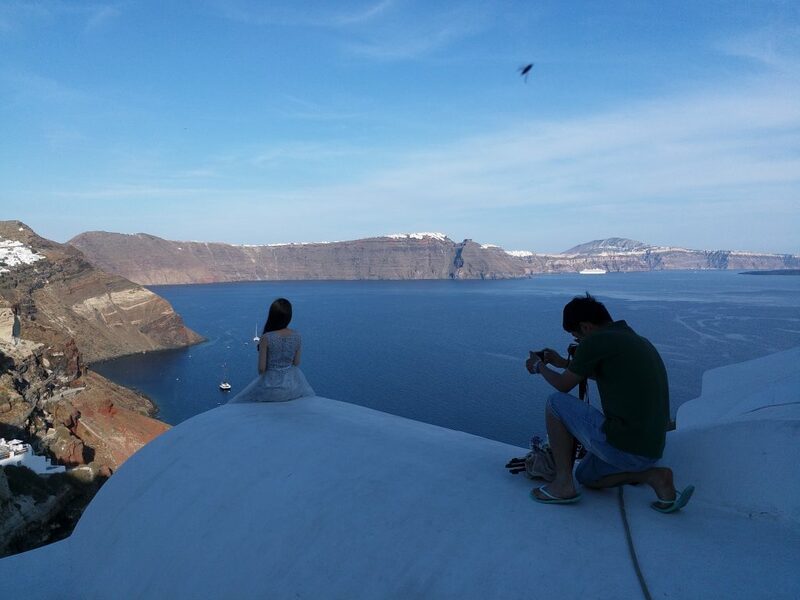 Many promotional videos of Santorini are shot in one of the hotels at the caldera. The view definitely costs you more and it might not be a good idea to stay at one of these hotels if you have limited mobility. I read from TripAdvisor that Perissa and Kamari are the most wheelchair-user friendly area. If you are driving, there are many choices on the island. If you are not driving, please make sure that a bus stop is within walking distance from your accommodation unless taking long walks is your thing. My family and I stayed at Firostefani which is right next to Fira the main town and it was very convenient. We were there for only two nights and because none of us drive, we wanted to stay somewhere central. We booked a cave house with beautiful décor. We thought since everywhere was expensive, we might as well choose a beautiful place rather than paying high price for the most basic accommodation. We enjoyed our cave house greatly. Please note that it is not possible to install air-con for the space deep inside. It is supposed to be cooler inside a cave house than a regular one, however, Santorini reaches 40 degrees in the hottest months. My cousin slept in the bedroom without air con and found it a bit too warm but my auntie and my mum felt good. I guess it’s also up to personal preference. 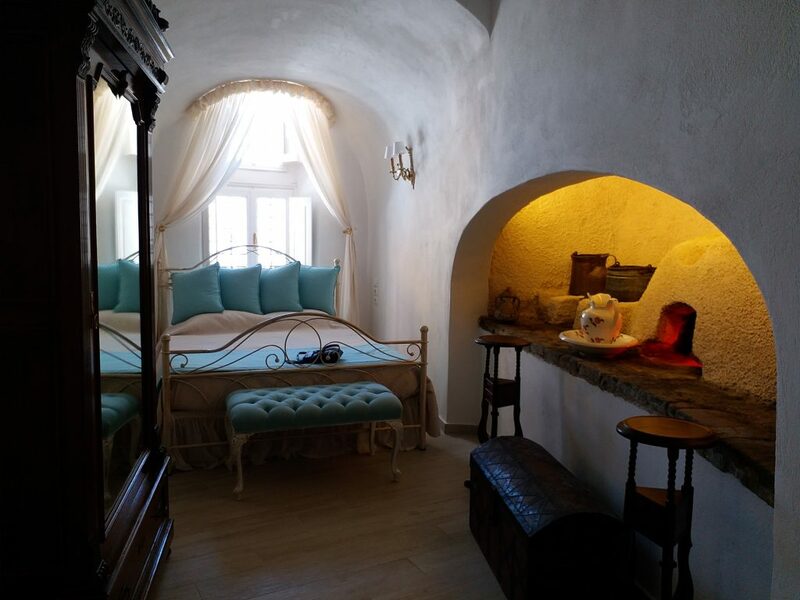 One of the bedroom in our cave house. The most luxurious sofa bed I ever slept in! July and August are the busiest months for all the Greek islands. The hotels are often more expensive and fully booked. There are also many cruise ships daily bringing even more people. Usually the weather in May is already warm but the sea can be still a bit cold. The weather starts cooling down at the end of September but the sea is still warm because it has been warmed up by the hot summer sun. Our relatives who live in Kefalonia (another island) said they often swam till Christmas. If beach holiday is not your thing and if you prefer some peace and quiet, you might find winter or early spring much more enjoyable. Some shops and restaurants are closed during the quiet months though and the public bus service is sporadic. Found some peace and quiet where there was no view at Oia. Where to eat – Beware of the liars and the cheats! There are many tourist traps and unfortunately, my family and I went to two of these traps. I believe popular tourist destinations such as Santorini do attract great restaurateurs to showcase their skills. We just need to seek them out with some thoughtful planning. If you are prepared to pay and enjoy some delicious food, seek out some honest looking locals or fellow travelers and ask for recommendations. Please also read online reviews and pay attention especially to the bad reviews as we all know now that some restaurants owners would ask their friends and family members to write good reviews for them. Our honest and trust-worthy house manager Amalia recommended us Kokkalo Restaurant at Firostefani. My family and I loved every dish we ordered. The ingredients were all fresh and of good quality and the prices were reasonable. 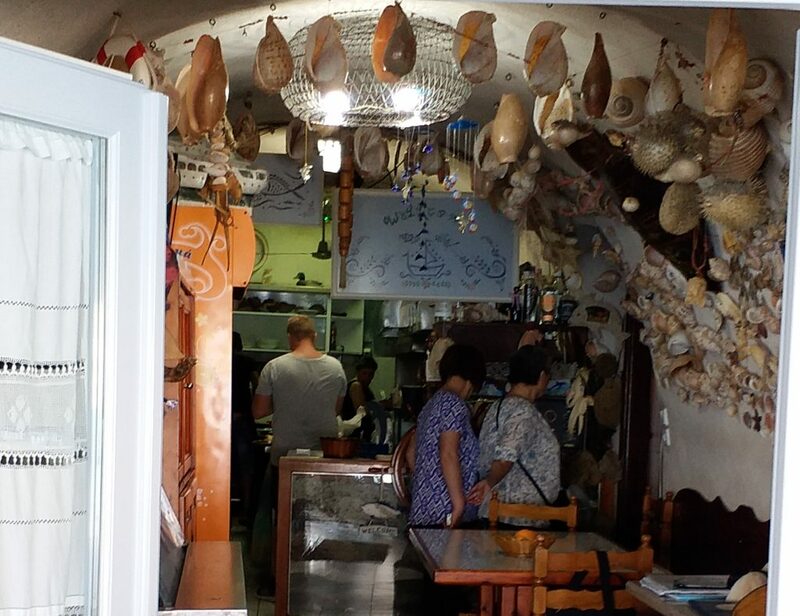 Amalia also recommended us The Dolphins Fish Tavern at Akrotiri. We only had a quick snack there but we drooled over the lobster pasta that other customers ordered. The tavern is by the sea and is very relaxing there. Pancetta at Kokkalo Restaurant. Yum! The Dolphins Fish Tavern offers lovely setting. My Mum and Auntie inspecting whatever they were cooking up in the kitchen of The Dolphins. Chinese people like to eat and my family is prepared to spend on food during their holidays, although of course they would like to pay for only what is worth. 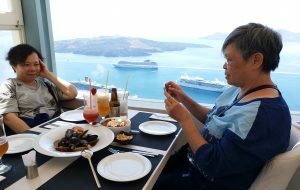 Knowing that everything costs extra in Santorini simply because it is a famous island, I suggested that we only went for the cheapest options. But then my uncle saw a picture of seafood pasta outside a restaurant at the square in Fira and fell in love. The prices on the menu were a bit high but my family understood about high rent for prime location and decided to eat there. When the food arrived, we were quite upset because not only that the food was tasteless and blend, the ingredients were all of the cheapest variety. The seafood was nothing like in the pictures but the frozen ones that you get when you order the cheapest pizza. Greece is land of plenty but the salad we had was old and dry. 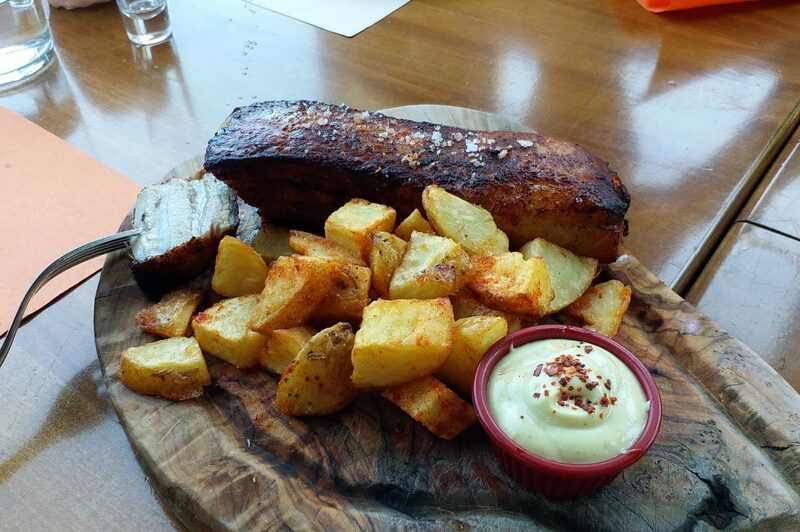 The serving staff were pushy and no apology was offered when we pointed out that the food was below standard. We were also charged 4 euro for a few small slices of poor quality bread. The most horrible experience was when we decided to have ice cream while waiting for the ferry to Crete. A waiter asked us where we were going and said that our ferry was delayed. I asked how would he know and he replied that they always checked the ferries to inform the tourists. He also said that our ferry would depart right opposite their café. I spent a whole summer in Mykonos last year and the ferries there didn’t seem to have a solid system where to park so I was glad for this information. Later we found that he lied to us about the delay and where the ferry would park just so that we would choose his café. It was lucky that my cousin went for a walk and saw our ferry approaching. She also saw that there was actually a building at the far end of the harbour where all the tourists were lining up. This waiter and his colleagues laughed at us as we rushed off to catch the ferry. You might think that I am gullible to believe this waiter’s words and I agree. At that time I had been living in Greece for over a year and I always met the nicest people. My guard was totally down and I also wasn’t prepared for crooks like these. We could have missed our ferry and they didn’t give a care. The ice cream that we had were also far from what they showed us in the pictures. I suggest that you avoid all the restaurants and cafes at the prime locations such as the harbour and the square. I told my Greek language teacher about these bad experiences. Santorini is her favourite island and she said that we could enjoy its beauty as long as we were careful about these traps. I think it is not normal that one needs to be careful when traveling to a safe country like Greece but Santorini is like a minefield, dotted with crooks. Sophie looked heart-broken when I told her about our bad experiences in Santorini. Santorini is her favourite island because she loves the energy there (except Fira the main town which she avoids) and the great cuisines. I asked her to tell me some of the places that she loves. Sophie said that unfortunately unless you have a car, you will only go to all the tourist places. For her visits, she stayed at Pygros which is a lovely village. She prefers the south part of the island because it is less touristy and less explored by people. She said you could find some peace and quiet there. She also likes Akrotiri and some other quiet villages. For the sunset, she recommended watching it at the lighthouse near Akrotiri. Another place where she had enjoyed the sunset was Santo Wines Winery when she and her husband were there for the wine tasting. She said it was quiet there and the view was breath-taking. For those of you who enjoy wine, Santorini produces some of the world famous wines and is a good place for you to bring some wine home. She found other small beaches on the south of the island but she couldn’t find their names on the map. Some beaches have a tavern but she didn’t come across anything special. She also saw people scuba diving in one of these beaches. If you drive around, you will notice some of these small beaches like Sophie and her husband did. She said there are now new beach bars on the south parts and these are often quiet and relaxing bars rather than for party people. 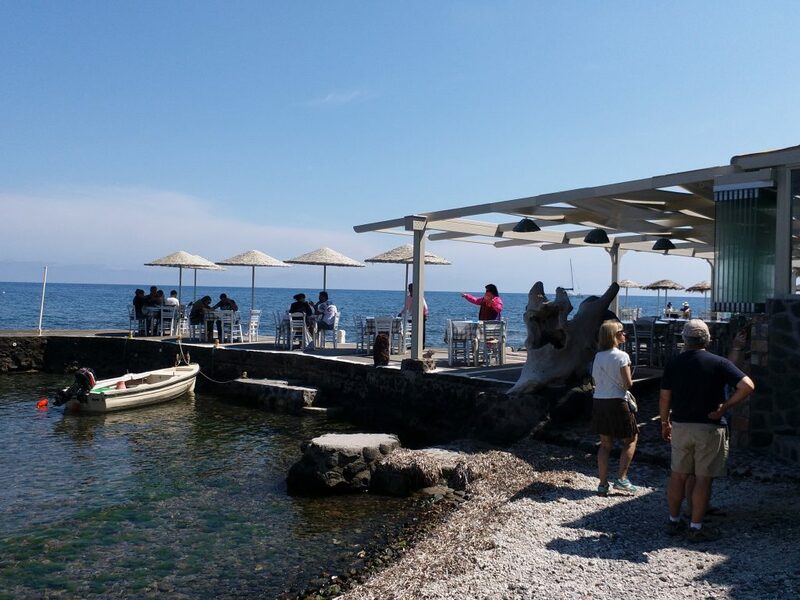 Sophie thinks the best tavern in Santorini is Anna Good Heart Tavern which is on the way to Akrotiri. Anna is a great cook and she grows her own food so everything is fresh and tasty and the prices are reasonable too. Vlychada Beach. Sophie my Greek teacher loves the moon-like cliff. Photo by Sophie the Greek Teacher. One of Sophie’s favourite small beaches with no name. Photo by Sophie the Greek Teacher. Another example of small beach with no name on south of the island. Photo by Sophie the Greek Teacher. Great view at Santo Wines Winery. Photo by Sophie the Greek Teacher. Sunset at Santo Wines Winery. Photo by Sophie the Greek Teaher. Καλό ταξίδι (kalo taksidi = Good journey)! I wish everyone can have a lovely time in Santorini! If you come across any good restaurants, beaches etc, please write on the comment so other travelers can enjoy the places that you did! Ευχαριστώ πολύ (efharisTOH poLEE = Thank you very much)! 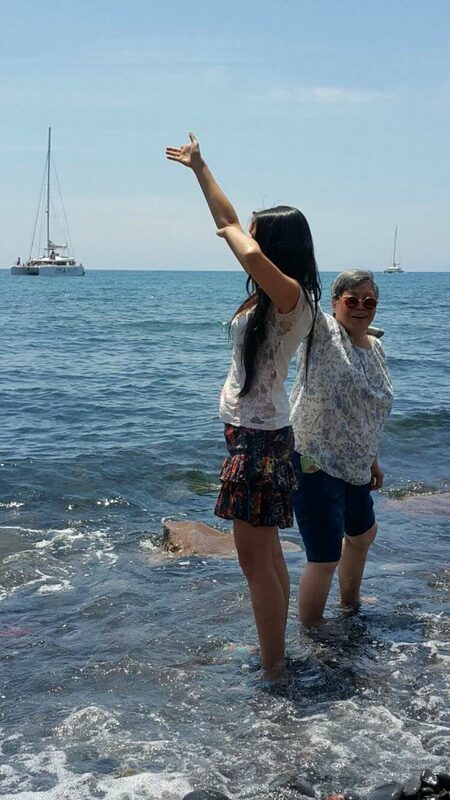 My Mum and I at Red Beach. Photo by my Uncle. My sincere thanks to Sophie the Greek Teacher for sharing your favourite places with me and the use of your images. Big thanks also to my Cousin and my Uncle for the images. 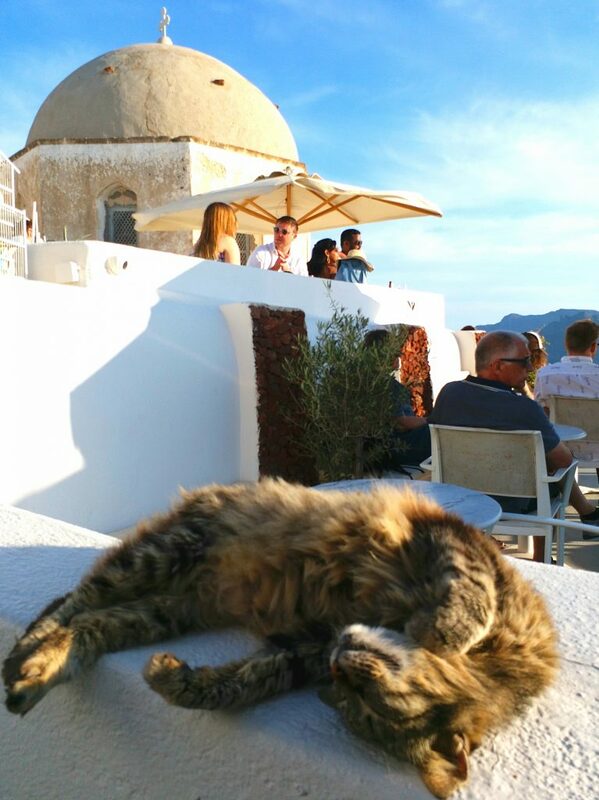 Of course there are plenty of cats on Santorini!